We scrapped, we ate, we wined! 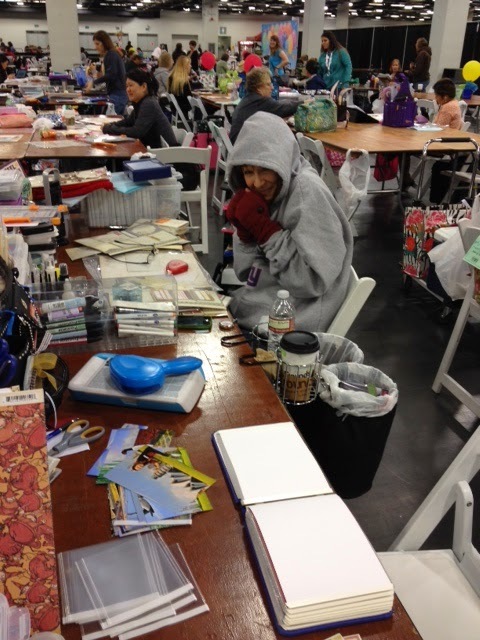 Back from the Anaheim scrapbook expo! Got 10 pages completed, still have a couple more pages to go to finish my Europe trip book! 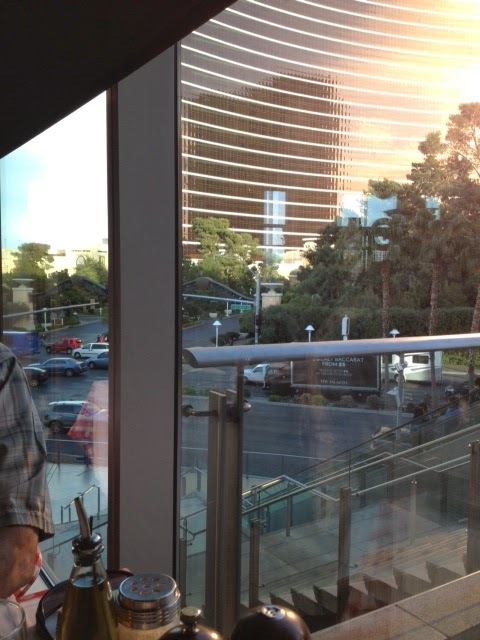 We stayed at the Double Tree Hotel near the convention center, walked back and forth, walked to restaurants. Love that! 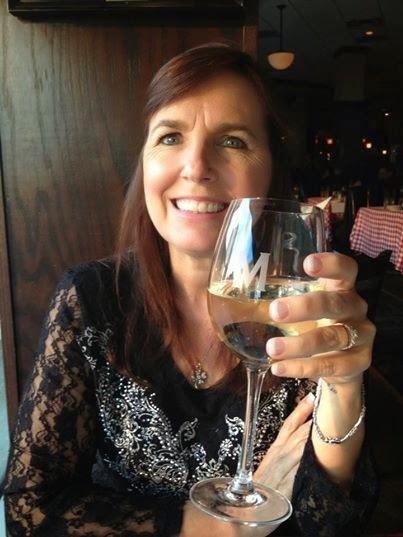 We arrived Thursday, went to the store for wine and snacks, then just ate dinner at the hotel restaurant, very good food, had mushroom raviolis, my go to food right now!! The breakfast burrito in the mornings was phenomenal. We set up at the crop and got to work, well, we talked, shopped, scrapped, then dinner Friday we walked to Buca di Peppo, then back to scrapping and wine. Back to the hotel for some sleep at midnight. Saturday morning up and at it again, cropped, shopped, Mary F. joined us today for some cropping fun, we headed to the Cheesecake Factory where Travis and Rebecca met up with us, Rebecca's birthday is tomorrow so we gave her gifts early, Christy and I went in on a fit bit for her, she loved it! We finished up Saturday night and packed it all up, got some sleep and I headed home Sunday! Another fun filled, scrap filled, wine filled, weekend with the girls!! 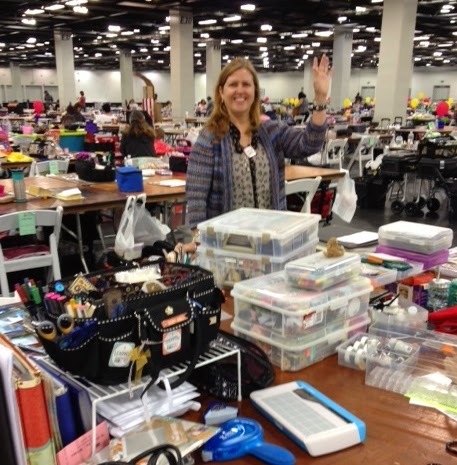 Christy and our scrap table! 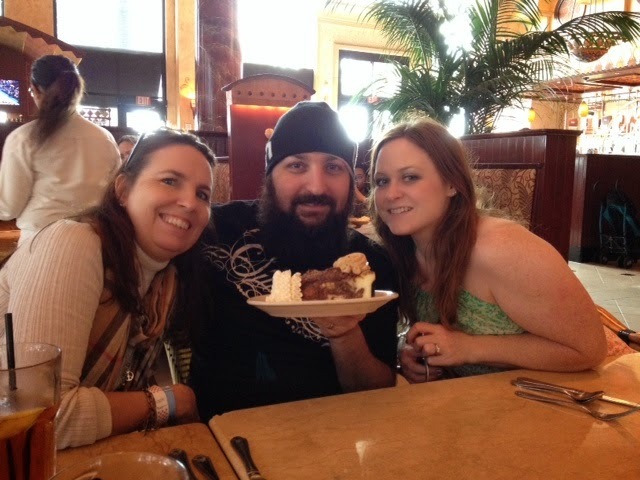 Me and Travis and Rebecca, cheesecake was peanut butter! The croppers, about 400 of us were there! Got my Ontario layouts done in my travelling scrapper book! Love the themes they come up with! I voted for pajama party for next time! Trip to San Diego with Charlie in mine and his scrapbook. The farm in Italy we went to. My next trip is my cruise to Scandinavia, so I must finish up my Spain and Italy book before I leave for that! Be back soon with more fun and exciting news from Las Vegas! 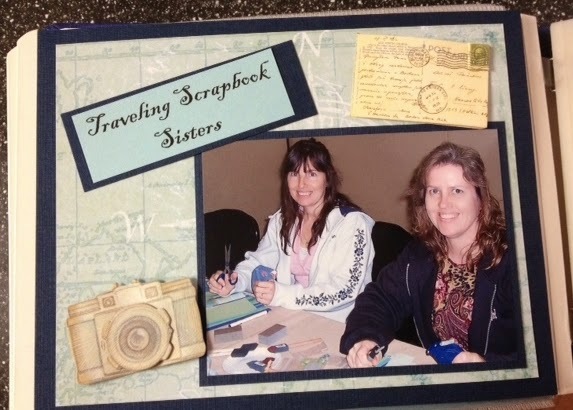 Me and my sister, Christy, in a scrapbook layout I did for my travel scrapbooks! Going to be scrapbooking all weekend! Oh, and I take my TAP exam to get travel agent certified! Not sure how that is going to turn out, so many codes to remember and so much information out there!! It is a 100 question test that I have to accomplish in two hours! But, I will give it my all and hope to get a little job in a little travel agency somewhere, just to make enough money so I can keep travelling! Lots of living to get busy doing! See you back here soon with more fun in the sun! 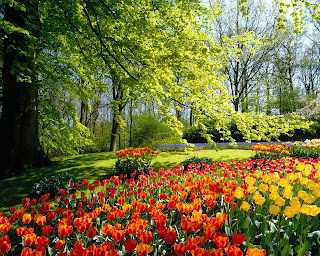 Oh and Happy Spring!! Just a couple more months until summer, wheeeeeeeeee! Thursday was my 49th birthday. yep. 49. ugh. In the sweet words of Garth Brooks: "I'm too young to feel this damn old"
Hubby took me to a nice dinner then we walked around for awhile and came home to go to bed at 9. Yes, we are old people, we eat by 5 and go to bed at 9. We like being old fogies! 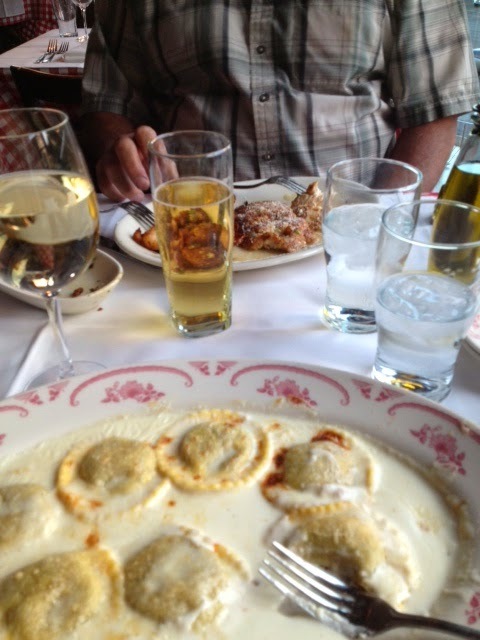 We went to Maggiano's on the strip next to the fashion show mall, I had the Mushroom ravioli's, and they were so delicious!! My view out the window, That's the Wynn resort, so pretty! I have some lovely gifts from my friends and family I need to a show you, so stay tuned!! Nothing really new going on, spring cleaning, working for the man, studying. Yes, I do that, being the foodie that I am, I know I have to exercise to be able to eat all these incredible dishes I keep finding on pinterest!! This one is a doosie!! And because it is pasta, there has to be wine involved, I am a true Italian, wine with food....OK, so I am not Italian, but I should be! I do talk with my hands for some reason??? The fitbit force is my new motivation, thanks to my friend Colleen who is a fitness-aholic.. you name it she has tried it, and she looks great for her age, in fact she looks younger then I!! and she is not by a bit much. Would never know it!!! People probably think she is my younger sister!! She got me and my sister hooked on the fitbit force, it monitors everything you do during the day, steps walked, food ate, calories burned, even your sleep pattern!!! Our goals are 10,000 steps a day, it tracks those for you and buzzes on your wrist when you have accomplished it. We are all hooked up with each other so it is usually Colleen in first place, Christy-my sister- in second, and then me...but this thing really motivates you and you want to hit that 10,000!! And you want to try to beat your sister and your friend!! Run out and get one today, at 120.00 it is a real bargain to keeping in shape. Walking 10,000 steps a day is four miles a day and is usually the calories you take in each day if you are careful, that way you can maintain your weight or you can lose weight. You choose! 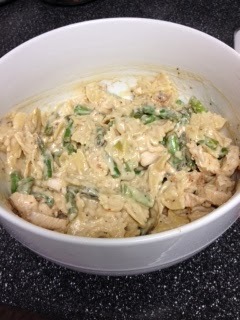 Now on to the awesome recipe I found on ...yep....Pinterest!!! 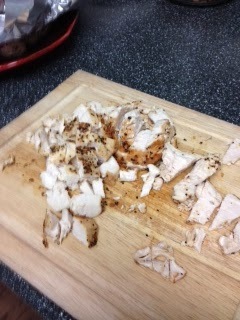 I added my to die for "grilled, roasted chicken" and it was fabulous!!! I also upped the pasta to 2 cups, added lemon juice with the zest, crushed red pepper and fresh grated parmesan. I am in love. Cook pasta according to the instructions on the package. Drain and keep warm. In a large skillet, heat up oil over a medium heat. Add asparagus and saute until soft, about 2 to 3 minutes. Add garlic and stir it in. Cook for 30 seconds. In a medium mixing bowl, whisk together milk and cornstarch. Add the milk mixture to the sauteed asparagus, gradually, 1/4 of a cup at a time, stirring constantly. Let the sauce thicken before adding more milk. Repeat until you use all the milk. Add lemon zest and cook for 30 seconds. Add pasta and toss to coat it with the sauce. 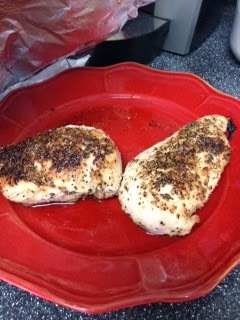 Chicken breasts, cook in olive oil, butter and salt and pepper and lemon pepper, brown in skillet, then transfer to oven for 20 minutes, let rest, then slice up! Perfect!!! 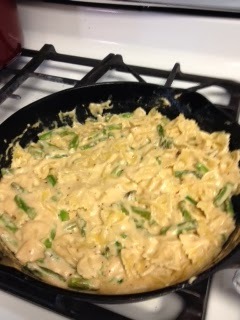 The pasta getting all creamy wit it! hahaha! Toss in the bowl wit the chick and waa-laa! 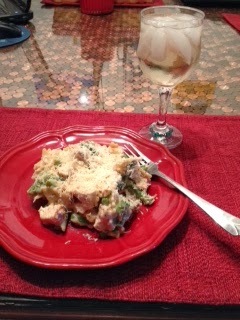 Throw on some fresh grated parmesan, add a little pinot grigio, dinner is served!! Oh, yes, I add ice to my wine...shoot me. I have to have ice cold drinks!! 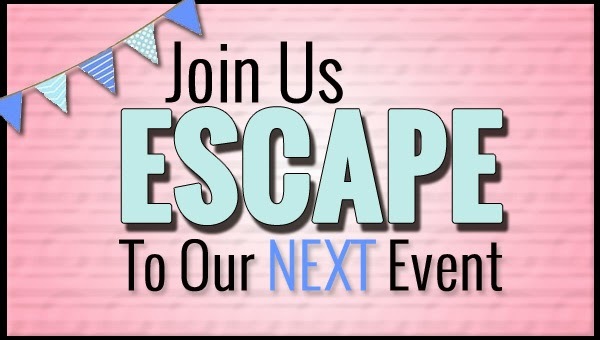 See you next time on onecreativecat.com where wine and fun and food come together! Been raining here in the desert, I have been staying in. Cooking, studying, doing some spring cleaning! This is a very simple fool-proof banana bread, it is the one my husband absolutely loves! Cream the sugar and butter, add eggs, mix well, add bananas, mix well, add flour, salt, baking powder. Mix well. Pour into greased 9x5 loaf pan, Bake at 350* for an hour or until toothpick comes out clean from center. Let cool, then wrap and store in fridge, it is much better the next day!